This article is about the Egyptian first lady. For the human rights activist, see Nahla Mahmoud. Naglaa Ali Mahmoud (Arabic: نجلاء على محمود‎, IPA: [ˈnæɡlæ ˈʕæli mæħˈmuːd] or [næɡˈlæːʔ], born 4 July 1962) is the wife and cousin of the fifth President of Egypt, Mohamed Morsi and was First Lady from 2012 to 2013. Naglaa rejected the title of First Lady, preferring to be called "First Servant," the "president's wife," or "Umm Ahmed," a traditional name (kunya) which means mother of Ahmed, her oldest son. Naglaa married former president of Egypt Mohamed Morsi in 1979 when she was a seventeen-year-old student. Naglaa and Morsi have five children and three grandchildren. ^ a b Kirkpatrick, David D. (27 June 2011). "Egypt's Everywoman Finds Her Place Is in the Presidential Palace". New York Times. Retrieved 17 May 2015. ^ Brulliard, Karin (28 June 2011). "Egyptian first lady-to-be, Naglaa Ali Mahmoud, blends in but sparks debate". Washington Post. Retrieved 31 July 2012. ^ Batrawy, Aya (28 June 2011). "Naglaa Ali Mahmoud, Egypt President's Wife: Don't Call Me First Lady". Huffington Post. Retrieved 31 July 2012. 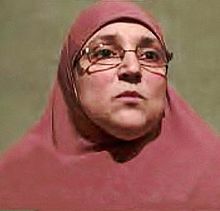 ^ a b "Meet Um Ahmed, Egypt's new First Lady". Harakah Daily. 29 June 2012. Archived from the original on 1 July 2012. Retrieved 6 February 2013. This page was last edited on 11 November 2018, at 13:19 (UTC).